National Audubon Society has recently launched Plants for Birds, a major initiative to improve native landscaping across the country. Research has shown that the single most critical factor to bird survival is the existence of native habitat. 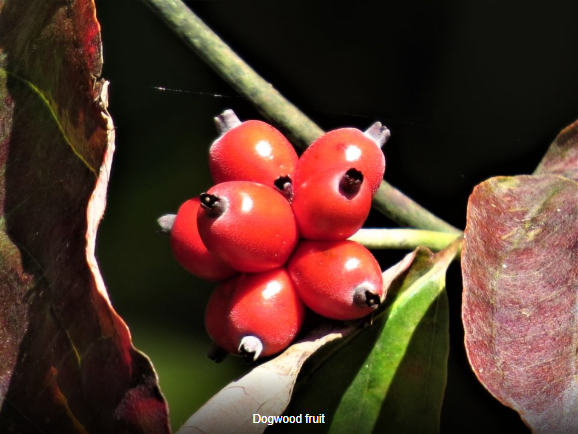 National Audubon has additionally commissioned the development of a Native Plants Database which allows users to search by zip code what plants are best suited to attract which species of birds. The High Country is fortunate to contain numerous natural communities which support a wide variety of native plants. Take a look at the database – it’s extremely helpful. HCAS is contributing to the national Plants for Birds effort in a variety of ways. In 2018, we launched the “Birds, Bugs, and Blooms” Nature Walk series. These informative walks, conducted by Bill Dunson , teach us about how all of nature interacts. Bill identifies species which help birds survive and also points out which species need to go!! Be sure and check out Bill’s Blog about all things nature. We also initiated the Garden Tours for Birders in 2018. Bill Dunson conducts tours of area yards, demonstrating what aspects help our birds and how to convert each yard into the optimum bird and wildlife habitat. Contact Bill at wdunson@comcast(dot)net to get on the list for a garden tour of your yard! HCAS has been working with the Wilkes County Habitat for Humanity to develop a series of native gardens within the Habitat projects. These gardens will provide useful learning experiences for the residents and provide additional native landscaping for birds and native pollinators. 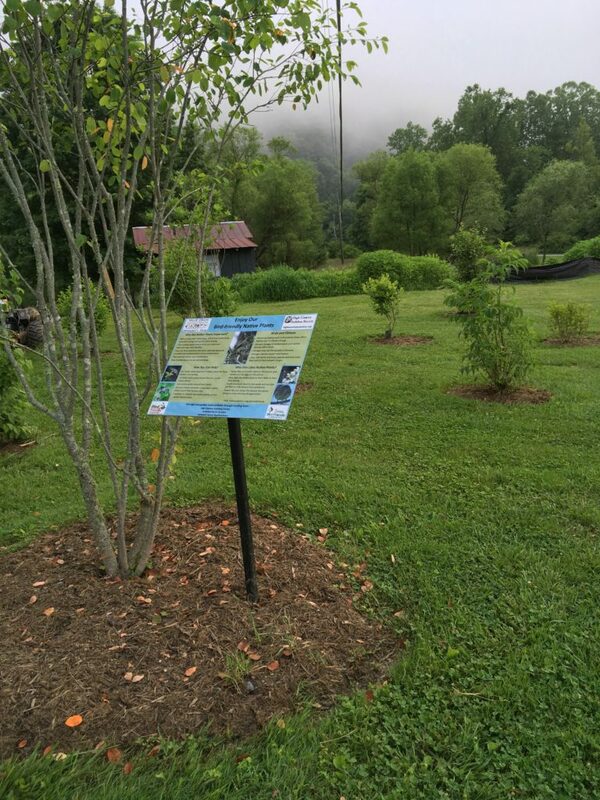 Collaborative Grants from National Audubon have been used to purchase native plants to augment the natural environment at two local parks: Valle Crucis Community Park in 2017 and Green Valley Community Park in 2018. These native shrubs will provide additional food and shelter to both migrating and breeding birds. Tying into the Plants for Birds Initiative is our School Native Gardens Program, which enlists area schools in the development of native gardens. The native garden is incorporated into an educational curriculum, teaching students about birds, native plants, weather, native pollinators and other pertinent topics. (See the “Hardin Park dedicates bird garden” article at WataugaDemocrat.com.) The students also learn to care for the garden in this program. 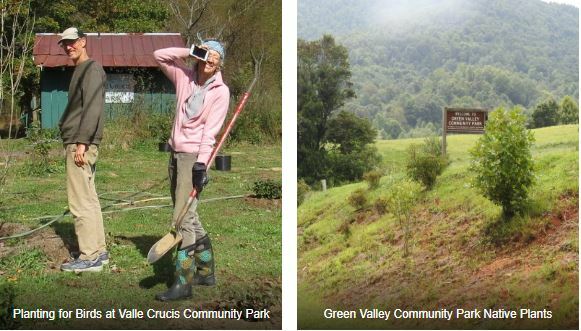 The additional benefit of this program is that not only does the garden help teach the next generation about the criticality of native landscaping, but the gardens provide needed native landscaping within the High Country’s more-populated areas. Hardin Park School is the pilot for the program. Funds for this project were provided by a grant from the National Audubon’s Coleman and Susan Burke Center for Native Plants. This grant funding was then matched by a grant from the North Carolina Native Plant Society’s B.W. Wells Stewardship Fund. Donations from Foggy Mountain Nursery and Highland Landscaping Supplies contributed to the project. Volunteers from both HCAS and the Blue Ridge Chapter of the Native Plant Society planted the shrubs and trees. The students from Hardin Park School planted the perennials.